I'm Mad and I Eat: Is This Summer Food? We have just under a couple of weeks until summer ends in the Northern Hemisphere, and I'm trying to use up as many tomatoes as possible. In years past, that usually meant raw tomatoes in salads with feta cheese, cucumbers and onions. Or gazpacho. For some reason, my mentality has recently allowed cooked tomatoes as a summer meal. 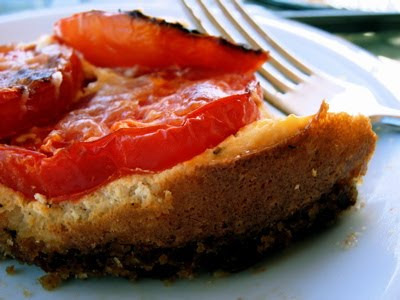 Look: a tomato torte. I can't even remember where I cruised across this recipe. As usual, I memorized the roughish idea, but not the proportions. It was based on bread crumbs stirred with a little olive oil. I thought it would be nice to incorporate some greenish herbs. Next layer was ricotta cheese mixed with a couple of eggs (and garlic and more herbs... and red chile pepper flakes... and salt, and black pepper). Top layer was slices of garden tomatoes. Bake for about 45 minutes. I used a spring-form pan that doesn't see much kitchen duty; I was so tickled to be giving it a workout. You might think this would be a meaningless pot of unrelated layers, but it all cohered. The tomatoes gave off a little juice that apparently migrated down to the breadcrumbs, and created a nice crust. The eggs and cheese transformed into a cheesecake-like layer of puffy scrumptiousness. Hell, I don't use the word "scrumptiousness." Call it "scrum." And the tomato slices firmed up into just what you wanted to eat, believe me. Ladies: I can't believe we ate the entire "pie" in one sitting. Cranky was in heaven. 'Young Clean Hair Women" watch your phraseolgy. That sounds great! When you mentioned cheesecake you got my attention. This will be made in the Beehive. Chilebrown: Beehive! Oh, god, if I didn't have a $2,000 vet bill today, I might get one a' those. Enjoy your pie. You will get it just right. Oh No! We hope Beansprout is okay. Chilebrown: Thanks for caring. Sadly, he died this morning. I can't believe it; he was only five years old. He seems to have caught encephalitis. How does that happen?! !